The mission of the Women's Division is to empower women in professional roles through programs that will mentor and advance leadership and growth opportunities through education and networking. 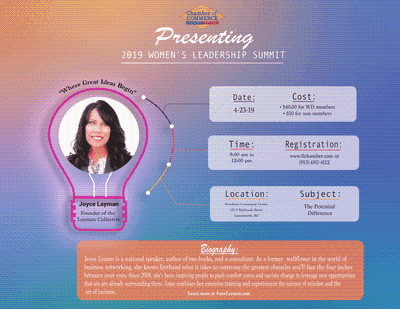 The Women's Leadership Summit is one of our most popular annual events, bringing dozens of women from all professions together, and welcoming special guest presenters in to offer their perspectives on women in leadership! This year's speaker is Joyce Layman, Founder of the Layman Collective, and she'll be speaking on the subject of "The Potential Difference." Joyce is a national speaker, the author of two books, and a successful consultant. As a former wallflower in the world of business networking, she knows firsthand what it takes to overcome the greatest obstacles you'll face: the four inches between your eyes. Since 2008, she's been inspiring people to push comfort zones and to navigate change in order to leverage the "new" opportunities already surrounding them! Joyce combines her extensive training and experience in the science of mindset and the art of business. Be sure to register today!!!! This event IS open to the PUBLIC - $40 for Chamber Members and $50 for Non-Members!